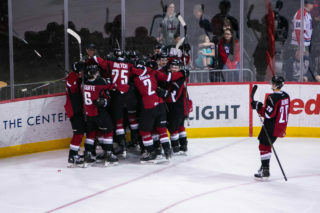 Tuesday night at the ShoWare Center in Kent, WA the Vancouver Giants earned a point in a 5-4 overtime loss at the hands of the Seattle Thunderbirds. Zack Andrusiak’s third goal of the game 34 seconds into overtime helped the T-Birds complete their comeback from a 4-1 deficit. Donovan Neuls chipped in four assists to aid Seattle’s victory. 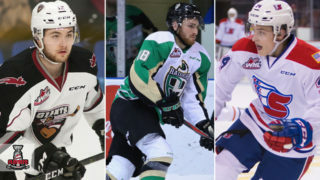 Tyler Benson had a goal and an assist in response for Vancouver while Ty Ronning, James Malm and Tyler Popowich also added goals. David Tendeck made 35 saves on 40 shots faced for Vancouver and was named the game’s second star. Seattle’s Liam Hughes took the win in goal making 24 saves on 28 shots fired his way. Andrusiak’s first goal of the game came 2:22 into the first for Seattle. He snuck to front of the net beside the right post and tapped home a pass from Turner Ottenbreit at the left point to stake Seattle to a 1-0 lead. 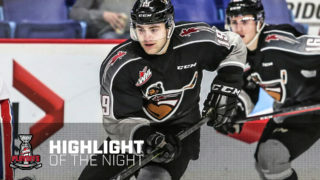 Vancouver responded with four unanswered goals, beginning with Tyler Popowich’s seventh which came at 16:24 of the first period. Popowich parked himself in the slot and quickly snapped home a feed from Aidan Barfoot to get the Giants back on even terms. Vancouver then burst out of the gates in the second, scoring three times within the first six minutes and 55 seconds. Tyler Benson grabbed the lead for the Giants when he potted his 22nd of the season past Hughes off a shorthanded two-on-one rush with Dawson Holt. Ty Ronning then increased Vancouver’s lead to 3-1 with his 54th of the season which came on Vancouver’s lone power play attempt of the game. 54 seconds later James Malm beat Hughes in close on a back-hand chance to vault the Giants ahead 4-1. Seattle’s comeback bid started at 13:57 of the second period when Nikita Milukhin knocked home a Matthew Wedman pass from in close for his fifth of the season. A shift later the T-Birds nearly made it 4-3, but David Tendeck lunged to his left to make a terrific left pad save off Nolan Volcan and the Giants maintained their two-goal advantage heading into the final period. Zack Andrusiak’s 26th of the season and second of the night came 6:11 into the third period on a deflection, and moved the T-Birds back within a goal. Then with their net empty the Thunderbirds evened the score when Nolan Volcan pounced on a Donovan Neuls rebound and stuffed it past Tendeck for his 27th goal of the season. The Volcan marker came with a minute and seven seconds remaining in the third. Seattle caught a break early in overtime when the Giants were called for a delay-of-game penalty. That set the stage for the T-Birds game winner that came off the stick of Zack Andrusiak 34 seconds into overtime. The goal came courtesy of a one-timer from the right-wing circle that just slid past the outstretched arm of David Tendeck. The final shots were 40-28 for Seattle who finished one-for-four on the power play. The Giants went one-for-one on their lone power play chance. The victory gives Seattle 29 on the season, and moves them eight points clear of Kamloops for the final playoff spot in the Western Conference. The single point for Vancouver pushes them 14 ahead of Kamloops for the third-placed playoff spot in the B.C. Division standings. 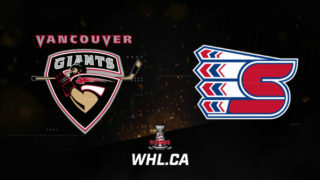 Up next for the Giants: A trip to Kamloops Friday to battle the Blazers in the first of a home-and-home set between the two B.C. Division rivals. With 10 games remaining in their season the Giants need just two more points or one regulation loss from Kamloops in their next eight games to ensure that they finish no worse than tied for third in the B.C. Division. Three points for the Giants in their next 10 clinches a playoff spot. 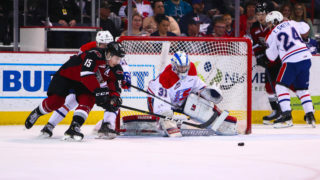 All four meetings between the Giants and the Thunderbirds in 2017-18 required overtime. The Giants finished the season series 2-0-1-1. With a goal and an assist Tuesday night, Tyler Benson extended his point-streak to six games. During that span he has three goals and five assists for eight points.